Photographer: Mario Sorrenti. Model(s): Anja Rubik. Source: The New York Times Style Magazine. Stylist: Jane How. 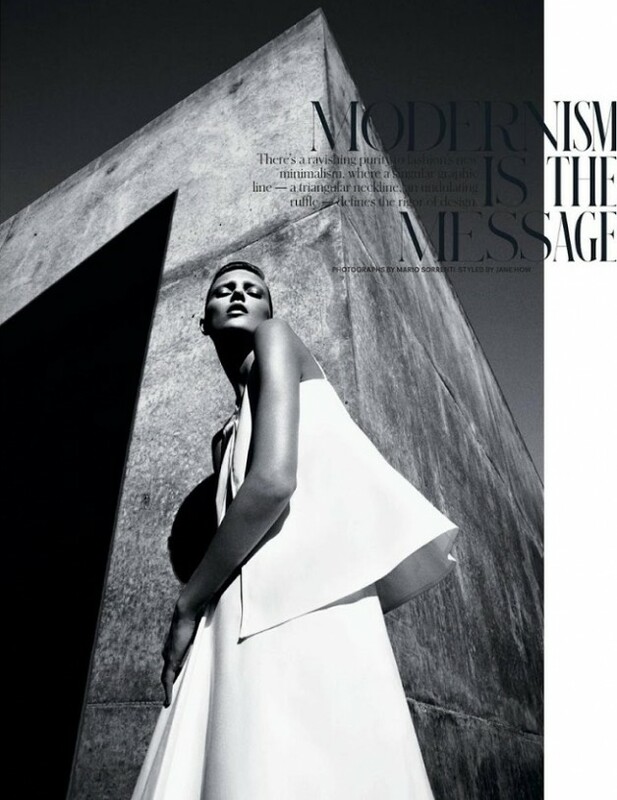 A poetic feat of Modern Minimalism, Anja Rubik shows us her best angles in ‘Modernism is the Message’ for The New York Times Style Magazine. Mario Sorrenti reveals the abstract beauty of style & structure, with his triumphant use of light, form, material and space. A movement founded on the theory of reductionism, this philosophy believes the power of simplicity comes from the potency of purity. By reducing any structure to it’s most essential elements, you are not just adhering to the “less is more” concept of creation, but you are attempting to expose them in their purest forms. Basic geometric shapes repeated, without ornamentation, allows the designs to form a unique bond with the environment, elevating them to their highest level. A revelation of spacial relationships, Sorrenti’s stunning images celebrates art of fashion architecture.